My oldest son is about to turn 10 in a couple of short months. And since we've moved into this house, he has his own bedroom for the first time in years. So you can imagine how excited he is to make the space his own. He has been very patient as he's watched me decorate every other bedroom in this house. (Okay, not that patient...he has asked repeatedly when it was going to be his turn...poor kid.) And now, his day has finally come! In addition to the the challenges of the space itself, we are facing a serious furniture drought. Mr. One is going to need some major clothing storage, a new bed, bed side tables, and a desk and chair for homework. That's a tall order, and although you all know how much I love thrifting for furniture and giving new life to the "previously loved", we decided to take a more contemporary approach to the space. So with that in mind, and the fact that I am on very strict budget, I saw only one solution. And it is spelled I...K...E...A. At first, I considered getting Mr. One a large dresser to hold all of his clothing folded up. But then I decided that a wardrobe or an armoire might be a better solution. 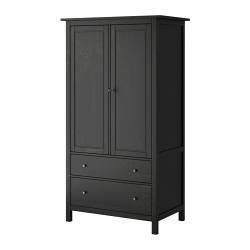 Enter the Hemnes wardrobe. With this armoire, Mr. One can hang his shirts, use baskets for his underclothes, socks and miscellaneous items, and use the drawers for his shorts and pants. Not only that, but placed across from the bed, it will visually balance out the high window. Next up...a homework desk. I love the Expedit workstation. The bookshelves will be perfect for all of Mr. Ones stuff. He is a bit of a packrat, so using storage boxes that fit in the shelves will create a clean/uncluttered look with TONS of storage. 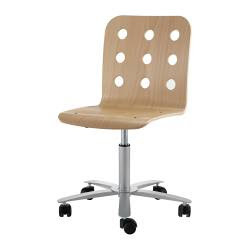 I love the idea of using the Jules chair in a contrasting light wood. It looks clean and modern with a touch of whimsy. 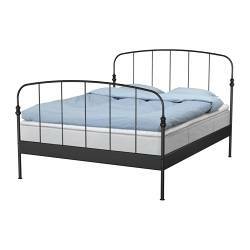 Finally, I love the Lillesand bed. It's metal with fairly clean lines and looks both traditional and contemporary at the same time. Perfect. The bedside tables are currently just a vision in my imagination...but I hope that with the Hubby's woodworking skills, we'll be able to make them a reality. So you'll have to wait and see...right along with me. Now to nail down the color scheme. I have already made the window treatments in deep indigo denim and blue ticking fabrics. And Mr. One has picked out his first piece of "art" for the room. A poster of Percy Jackson : The Lightning Thief. (He's a huge fan.) I actually really love the colors in the poster...primarily dark blues and grays, so I'm going to try to work within those paramaters...adding a touch of something brighter for punch...maybe yellow? That remains to be seen. I hope you'll come along with me on this decorating journey as I create a room fit for a tween! My interview on FaveCrafts radio is coming up this Sunday at 7:00 EST on BlogRadio. I'd love it if y'all would tune in!! Sounds like you've got it all figured out! I have used those cube storage units from Ikea in both my boys rooms, to help keep them organised, they work well and hold a ton (good and bad)! What a challenge decorating for a tween boy. I have two LITTLE boys and it's still pretty easy because they could care less about decorating, I'm the only one who cares right now. I don't know what I'll do when they actually have an opinion about it all. I love the idea of using Percy Jackson though, I love that series. I don't remember all Percy had in his "cabin" but you might be able to take some ideas from there. for a storage and size challenged room, (been there, done that) might I suggest you look into one of the bed frames with drawers under the mattress, they have a ton of storage for folded clothes, you can get them only one drawer high or like my husband and I had, the two drawer high, which mattress with box spring makes the bed quite tall, but we loved it. We found ours in an unfinished furniture place, you can paint it and distress it to look like it's been there for a million years. They don't come with head boards, but you are pretty darn creative, you can do so much..
You have visited the blog..Knock on Wood? You can make everything!!! Oh my goodness, I just posted yesterday about this exact same thing with my son who just turned 13 and furnishing his new room mostly from Ikea. Can't wait to see how yours turns out! I know all about small rooms and the challenges it brings - can't wait to see what you do with yours. 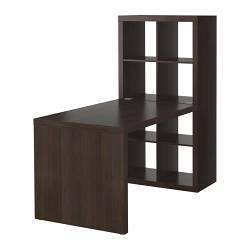 Just popping in to say we have the Expedit Workstation. LOVE IT, But it is HUGE ... so be prepared!!!! It takes up half of the wall in the office. I think there are some pics of it on my blog. Should be in January or February - anything with the title OFFICE in it should take you there! seriously...tween boys are so hard..who would have thought! Love the layout - can't wait to see it come to life - I love the poster. The colors are lovely.